Storyboards are essential to the design process and help Emily Morrow Finkell transform inspirations into products. They heard it before they saw it. 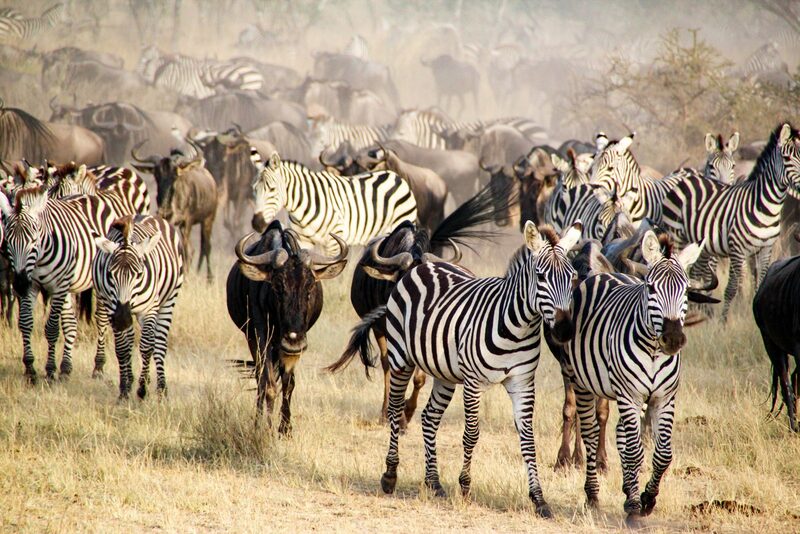 For several days, Emily Morrow Finkell, CEO of Emily Morrow Home, waited to witness the “Masai Mara,” a migration of nearly two million wildebeest across Africa in search of greener plains and savannas. On the second to last day of her trip to Kenya this past August, while perched atop a safari jeep with husband Don Finkell, CEO of American OEM, cameras and scopes zoomed in, Morrow Finkell saw movement across a nearby river. They felt the wildebeest hooves echo like a rumble of thunder as they took off in a blur of color — a moment that would later serve as the chief source of inspiration behind Emily Morrow Home’s 2019 hardwood collection. For a short video clip of this experience, click this link “Emily Morrow Home’s Design Journey“. Dalton, GA: The Emily Morrow Home collection for 2019 is twelve-SKU range of cooler browns and warmer grays, drawn from scenes Emily Morrow Finkell, CEO, observed of lion fur, zebra manes and the hides of rhinos, elephants and, of course, wildebeests. But her recent visit to Kenya isn’t the only story — a mixture of other memories and travels also appear in the upcoming collection. For example, Paddock, a gray brown with subtle shading, ushers in sights from the Kentucky Derby. And, similar to that, Justify is a warm brown that mimics the Triple Crown-winning racehorse it’s titled after. Each SKU is different, whether it comes down to an oil-rubbed look, a super dry low gloss, an ultra-micro bevel or a white plaster imitation. Yet despite the variability, there’s still some flexibility with the possibility of further customization. One aspect that is the same across the collection is the addition of MorCore, which will give the floors an enhanced 3.55 mm wearlayer. The thicker platform, Morrow Finkell mentioned, is in response to designers asking for a little bit more when it came to the wearlayer, which is previously 2.5 mm thick. Both, however, also come with a “Donatella the Truffle Dog” scratch resistance. New to the collection is the upgraded MorCore, which features a sturdy 3.5 mm wearlayer. For Morrow Finkell, the collection now has even more to love. With a greater durability, an increased width and length, and a higher impact resistance, Emily Morrow Home wood flooring can be used for both residential and commercial undertakings. 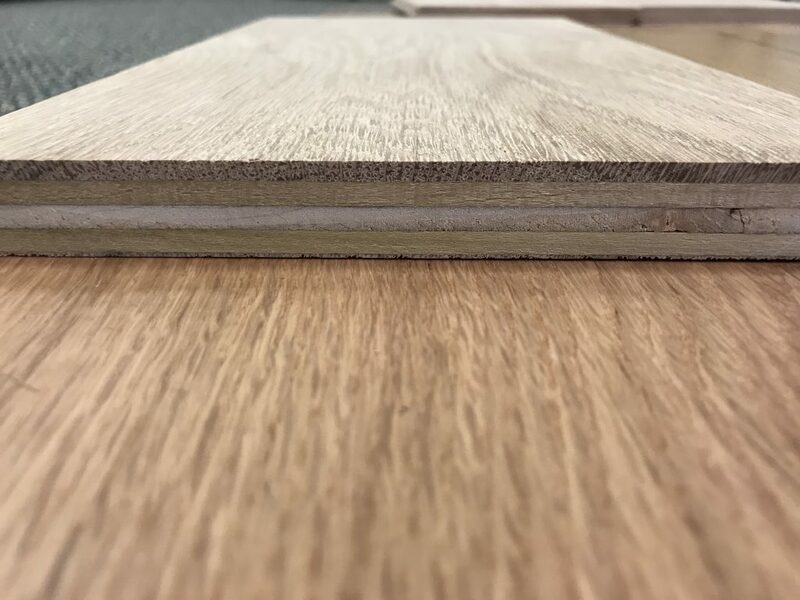 In fact, the new white oak option in taupe, which features a smooth surface and is seven inches wide, is currently being installed with Apex Wood Floors for a commercial project to elevate a luxury appliance showroom in Chicago. “Because our products are so incredibly well-made and constructed — all the way down to the wearlayer, warranty and finishes — they can go across all categories with no issues or hesitations at all,” explained Morrow Finkell. Morrow Finkell also suspects there will be a few winners in the new collection of twelve, but she’s excited to see the market’s real response. For her, it’s about creating something fresh, but not something so new that people can’t embrace it and put it in their own homes. Currently, advance previews of the collection are being shared with select customers across the U.S., but is set to be fully unveiled at the Carpet One winter convention in early January with Emily Morrow Home as a vendor to CCA Global Partners, then at TISE later that month and Domotex USA in February. The collection announcements will also include EMH’s 2019 Color of the Year. 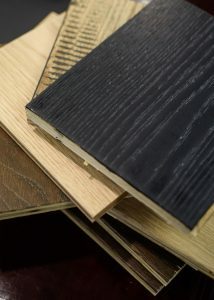 The 2019 hardwood collection from Emily Morrow Home will feature a product inspired by the company’s 2018 color of the year, a matte black, called Total Eclipse.